I'm going to take a step away from my paintings for awhile on this blog. I was feeling things were getting a little stale, and there are several new avenues I want to explore and experiment with. For the time being, I'm going to be focusing on improving the materials I use. Artists can never focus enough on materials. Most of us hope our pictures will endure at least as long as the works we see in museums, that are still giving pleasure to folks all over the world after hundreds of years. The art materials industry is full of reassurances, that the materials they sell are the best yet. Many of these products have not yet stood the test of time. Some notable works less than fifty years old are already falling apart. Some conservators have come out against the use of many older materials. They argue that a lot of what artists traditionally relied upon was inferior; they had no choice in many cases. The results: fading and shift of colors, cracking, etc. There is some truth to this. Some of the colors were impermanent. Others were very poisonous. Some were so rare and expensive only the most successful artists could afford to use them. This is the reverse side of a painting done by my brother about 20 years ago. He primed the raw canvas with a modern acrylic "gesso", made by a reputable company. 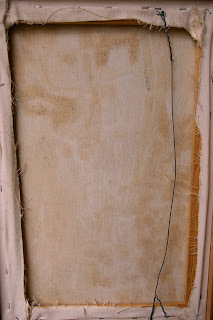 As you can see, the oil from the paint has penetrated through the primer, into the raw canvas. The acidic oil will slowly eat away at the canvas until it disintegrates. Next time, I will talk about my efforts to size and prime my canvases using traditional materials and methods.